I now have eight of these scans, in Jpeg format, and the biggest is around 10Mb [sorry, not Gb as posted before – thanks Rene]. They do give a lot of detail. I have four of f71r, 1 of f93r and 3 of f116v. and am trying to process them to post on this site. However, they are so huge that I am having problems uploading them. I am still working on making these as useful as I can for public view. However, to give you an idea of one of them I have managed to reduce the one below in size so that it can be uploaded to this blog (which has a file size limit of 2Gb). Given comments by Nick and Rene on another post, I am not sure they will be of great value or use, but who knows? Of course the originals are far bigger and do reveal a lot more detailed information. This is f71r – see the ‘normal’ version here. I completed a research paper on Han Purple not long ago and during my research came across some images of pottery painted with the Han Purple pigment. When x-rayed it produced a glow or fluorescent look, similar to some of the images above. I am not stating that this manuscript has Han purple, just mentioning as food for thought – as modern science has not been able to duplicate the pigment – and it caught the attention of particle physicists – I will post a few of the images I used I my paper, for comparison fun. Thanks Kelly, that sounds interesting. Can you tell us more about Han Purple? Is it a pigment which is mediaeval? Happy to share my pictures here (if I can get a nice copy) and my paper as well. I will attach both shortly. I will also see if I can find the PBS special on the Han Purple pigment too. Sorry for the ultra-long delay…such is the burden of consulting. I have a attached a power point presentation from my Chinese studies course that gives a quick yet solid overview of Han Purple and its history – the how and why. 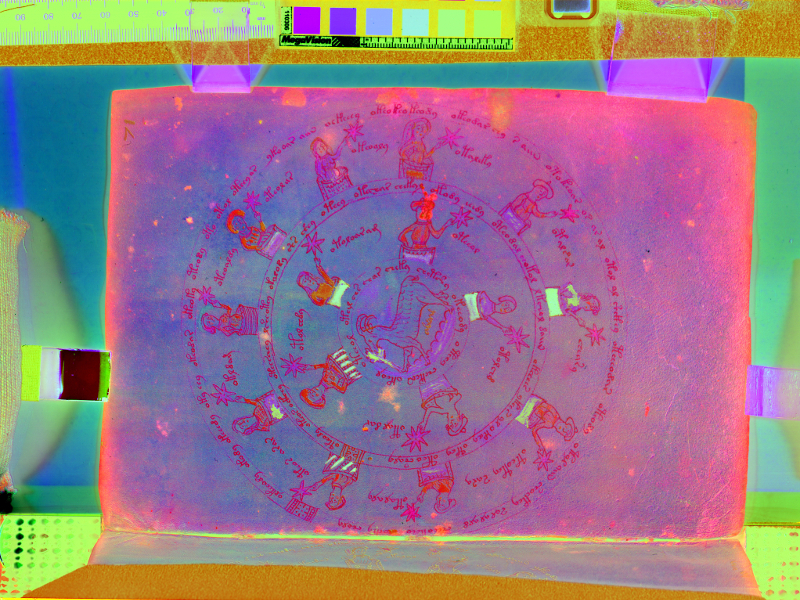 Slide 6 shows the x-ray similarities to this manuscript image above. The key point is that these types of light-absorbing and light-emitting abilities (that ‘white glow’) in pigments can be found in most copper silicate compounds. I can imagine that copper silicate could be used on vellum, as well as papyrus. Please let me know if you want the longer research paper on the topic. Both Han Purple and Han Blue were used in ancient and imperial China from the Western Zhou period (1045–771 BC) until the end of the Han dynasty (circa 220 AD). Han Purple becomes Han Blue when the pigment is heated for more than 24 hours. I’m new here. Cool site, Stephen. So, it’s been a few months since this post and I was wondering if there’s anything new going on with this? I followed the link to the Lazarus Project site but they have nothing up about the VMS… what’s going on? Yes, it is true that they didn’t post anything about their work on the Voynich as it was really a side issue for them! As for something new, we are taking small, small steps every time. Give us another ten years! Did they find any blood on the VMs parchment ? A solution to the size problem of the files might be to break them into smaller files using a program like WinRAR and them post the parts seperately to a download hosting site like “Zippyshare” ( http://www.zippyshare.com/ ) or any of the similar sites out there. They have an upper filesize limit of 200 Mb to what they will allow. Also, do you have any idea if the folios that the Lazarus project worked with might include the 9 Rosette? It would be interesting to see if their scans could recover any of the worn text/image damaged in the folds. It doesn’t sound like it would be worth the work. Each wavelength they scanned at to create the data behind this image it has a specific type of information to reveal about the composition of the materials, but we can’t just look at the image and see that information. It requires specialist knowledge of the wavelengths they used and what materials would be associated with the values they got for each wavelength in each pixel. The real analysis of the results is something we can only get from the people at the lab that did the scans. That report might include illustrations in the form of images like these, but if it includes one, it probably will include several more with various color conversions applied to illustrate separate parts of the findings, and even if we had all of those instead of just one multi-layer overlay, we’d have no way to predict the report’s text or the contents of its numerical graphs/tables. It’s like we’re waiting for publication of an article about forest management over the last few decades and for the foreseeable future, and choosing which picture of trees to use as a banner at the top of its webpage whenever it’s out. Without the real contents to go below the banner, there’s only so much effort that it’s actually worth.